... God saved you by his Grace, not by works of the law. Within the pages of Pastor Jerry Q. Parries’ new book, Grace The Real Good News of the Gospel, ($17.99, paperback, 9781498458269; $8.99, e-book, 9781498458276) readers will be encouraged to know that God is not mad or displeased with his followers. Pastor Parries explains that God took His wrath out on Jesus, so he could release all of his love on everyone. In the sight of God he is pleased with all of his people in every area of their lives because of the blood of Jesus. Pastor Parries believes that the world needs to hear the Good News – the news that Jesus forgives past, present and future sins. Pastor Parries stresses that everyone needs to know what the death and resurrection of our Lord and Savior Jesus Christ really means so that they might develop a true and loving relationship with our Heavenly Father. Pastor Jerry Q. Parries is a dynamic leader with an ability to present God’s Word with encouragement and empowerment. Ordained under the leadership of Bishop Paul S. Morton, he delivers God’s truth with an exceptional blend of inspiration, humor and love. Jerry Q. Parries is the founder and senior pastor of Christian Family Worship Center House of Grace, located in Orlando, FL. Christian Family Worship Center House of Grace is a ministry with the cornerstone message of GRACE. 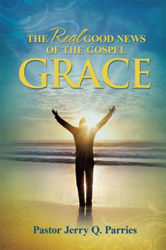 He recently released his first book, Grace, The Real Good News of the Gospel, where he systematically proves that God is not mad, angry, nor upset with us, and that God's GRACE has been afforded to all Believers. Xulon Press, a division of Salem Media Group, is the world’s largest Christian self-publisher, with more than 15,000 titles published to date. Retailers may order Grace The Real Good News of the Gospel through Ingram Book Company and/or Spring Arbor Book Distributors. The book is available online through xulonpress.com/bookstore, amazon.com, and barnesandnoble.com.